While theatre trade papers talked about a new Hippodrome being planned for Dundee the founding company was the King`s Theatre & Hippodrome, Dundee, Ltd with local shareholders, who, two years after the Theatre opened, announced they were going into voluntary liquidation having sold it on to others. 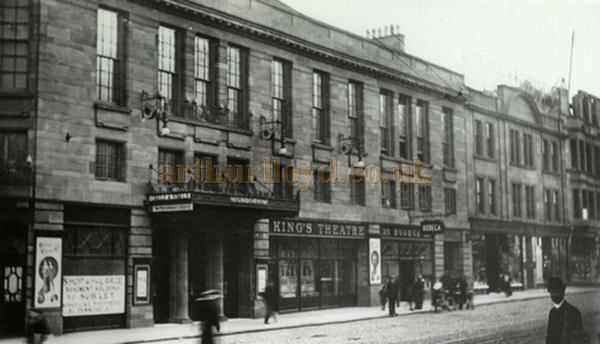 Right - An early postcard depicting the King's Theatre, Dundee - Courtesy Graeme Smith. The company started in 1908 and appointed Frank Thomson to design it. He and his brother Henry formed an architectural practice, encouraged by their father Alexander Thomson, City Architect and Engineer, who, a few years on, started designing the city`s statuesque Caird Hall, whose construction was to be delayed by the Great War. 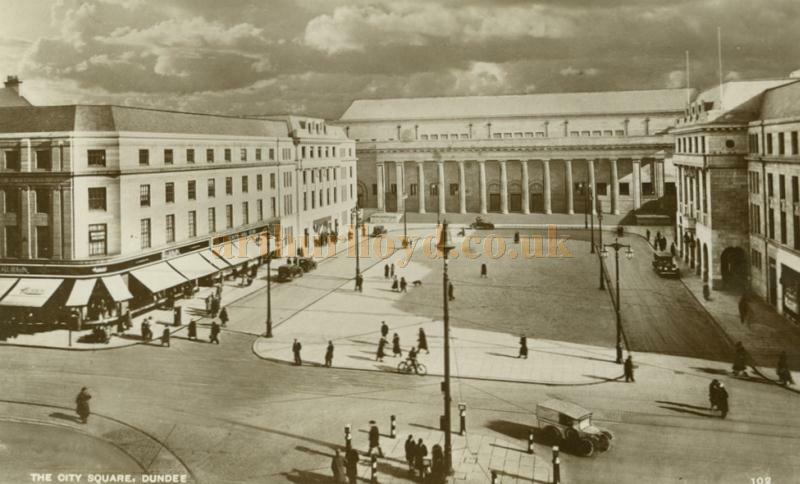 Above - Dundee City Square postcard showing the new Caird Hall the 1920s - Courtesy Graeme Smith. 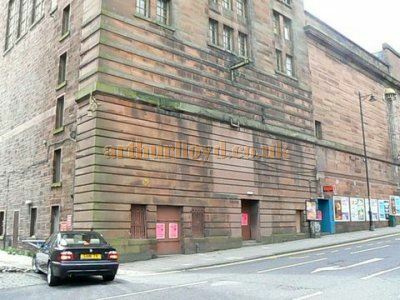 The new red sandstone Theatre in Cowgate had a variety and drama licence. It opened on 15th March 1909 and held 2,500 people of whom 2,227 were seated. 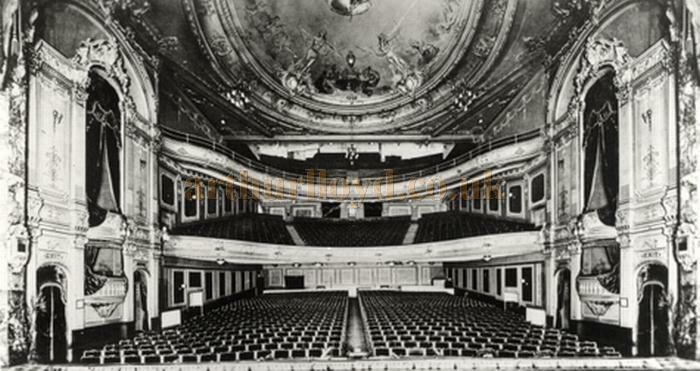 Its opulent interior had three levels; stalls, dress circle and a balcony, with boxes on each side of the stage. The saucer-domed ceiling displayed painted frescoes in allegorical style completed by F De Jong of London, and the proscenium arch was framed in marble. Above - The Auditorium of the King's Theatre, Dundee in 1909 - Courtesy Graeme Smith. 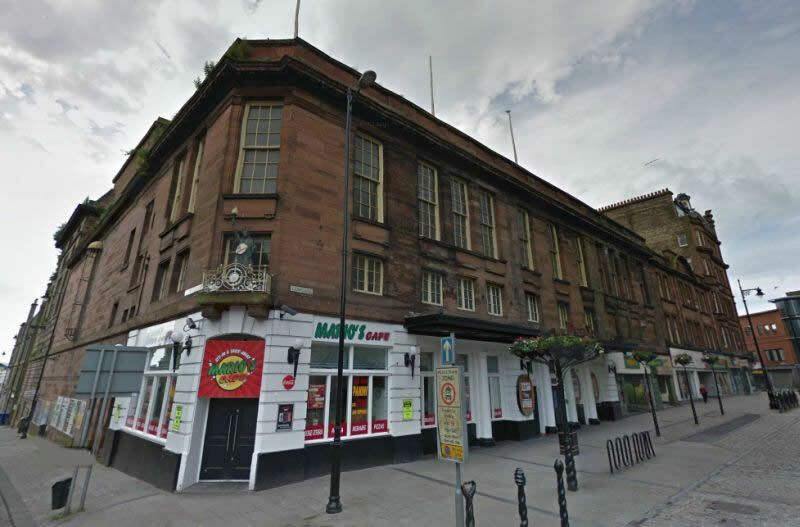 The original founding company faced financial difficulties and a new company was formed, Dundee Theatre Ltd. However, before its design was completed, Thomson family correspondence shows that a consultant by the name of Ward  most likely associated with United County Theatres - joined the team and designed the ornate ceilings. Frank Thomson`s own preference had been to keep the ceilings plainer, in American style. Direction of the King`s Theatre started under Alfred Moul(e), originally a musician, composer and critic, who had been successfully running the Alhambra Theatre, London and was now chairman of the United County Theatres Ltd (which included the interests of the Livermores); and as part of an expansion plan would also run the new Savoy Theatre, Glasgow, which opened in 1911 but very quickly became a cinema. His new Company also took over the Palace Theatre and the Gaiety Theatre, Dundee. One of his daughters became the actress and leading lady, Vanessa Lee. 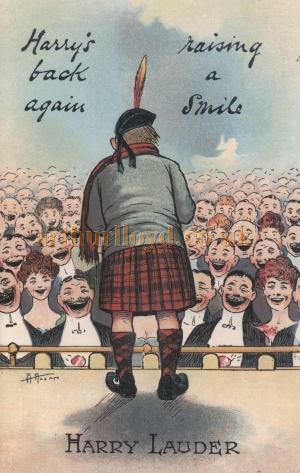 Right - Harry`s Back postcard of Harry Lauder audience - Courtesy Graeme Smith. Ex-Bailie Lockhart, originally from Glasgow, was one of the businessmen who built the King`s, at a cost of £44,000. He remained a director of the theatre until 1928, and in 1938 he took over the Savoy Cinema (known before as the People`s Palace Theatre) and restarted variety in it as the Palace Theatre. He was also a director of the Kinnaird Picture House. Lauder`s portrait today hangs in Dundee Art Galleries, and can also be seen at the BBC Online Art pages, here. Continuing into the 1920s the programming of the Theatre formed a triad of Theatres from the Moul fold, namely the Hippodrome Theatre, Derby, the Devonport Hippodrome Theatre, Plymouth and the King`s Theatre, Dundee. The Theatre staged variety, circus and concerts, revues, plays, musicals, ballet, and opera including the Moody-Manners Company, Carl Rosa, the British National Opera Company and much later the Sadler`s Wells Company. Its pantomimes included in its early years productions by Harry McKelvie who soon would be the pantomime supremo and owner of the Princess`s Theatre, Glasgow. The theatre also became the home of the Dundee Amateur Operatic Society. In 1928 the King's was sold to the national Provincial Cinematograph Theatres Co Ltd, and became a cinema with occasional live shows. 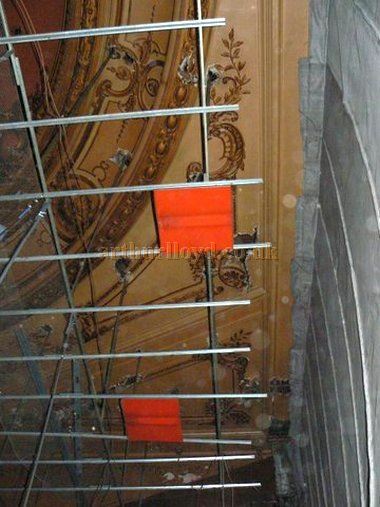 The balcony was closed off, making the capacity 1,458, a Wurlitzer organ was installed which rose from the pit and alterations were made to the proscenium to allow a screen to be hung. The stage continued for sporadic productions. By 1932 the cinema group became part of the huge Gaumont film and Theatre combine, which included Moss Empires. 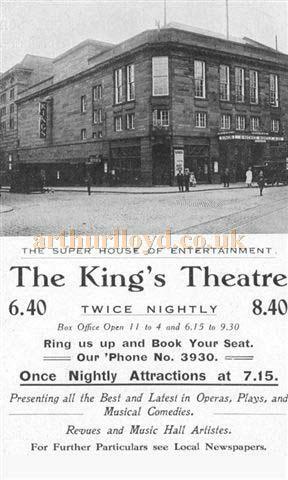 Left - A Dundee King`s Theatre flyer from around 1920 - Courtesy Graeme Smith. Memorably in January 1933 the King`s staged the pantomime Jack & The Beanstalk, produced by Robert Courtneidge and designed for touring in Britain. Its star was Will Fyffe, of film and theatre fame, and a native of the city. Dundee was chosen as the only Scottish venue in its run. In 1933/34 he started a 13-year run leading pantomime in the Alhambra Theatre, Glasgow. During the Second World War the King`s shut for the duration as a cinema but became the Garrison Theatre. From 1941 to 1945 it staged over 200 variety shows, revues and concerts usually on Sundays for uniformed personnel and their guests. At the end of the war it reverted to its normal name King`s Theatre - and shows continued from time to time including Peter Pan starring Phyllis Calvert. In 1950 Gaumont put their own name up. In 1955 the owners commissioned theatre and cinema architect Lennox Paterson of Glasgow to design further changes. Part of the balcony was dismantled, the proscenium streamlined and a false ceiling introduced in keeping with a modern wide screen. However Gaumont/Rank set aside a number of weeks each year for stage productions in their main venues including Dundee for musicals, opera and ballet by Sadler`s Wells and individual days for new performers such as Cliff Richard & The Shadows. Right - The former 'Get-in' at the King's Theatre, Dundee - Courtesy Roger Fox and Mike Hall. 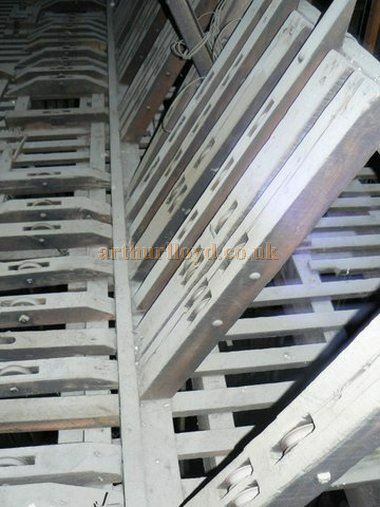 The photograph shows the Get-in has been stoned up (not bricked up) with a lifting beam still in place for a block and tackle and a roller to divert as the load was brought onto the stage. From 1961 it became solely a cinema with more alterations to its interior; changing its name to Odeon in 1973 until closure in 1981.Two years later bingo started until the late 1990s. It is now operated as a nightclub Deja Vu, with a false floor on top of the stalls. 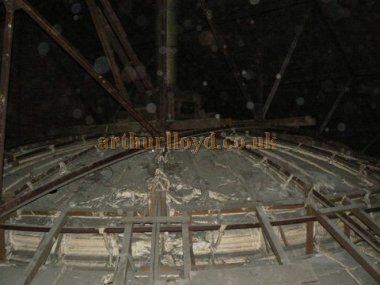 Fortunately because of partitions some of the Theatre construction can be identified, and above the false ceiling remains the elaborate plaster ceiling (See images below). The above article on the King's Theatre, Dundee was written for this site by Graeme Smith in February 2013. 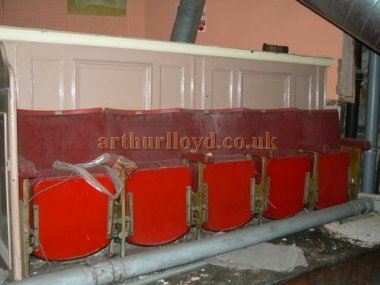 Above - The Dome of the King's Theatre, Dundee which is still visible above the framework of the false ceiling - And Seats still remaining in the Theatre's unused Circle - Photographs Courtesy Roger Fox and Mike Hall. Above - The Ceiling Plasterwork remains above the false ceiling of the King's Theatre, Dundee - And The Theatre's Grid which still has all its blocks - Photographs Courtesy Roger Fox and Mike Hall. Above Left - The Ceiling Dome Plasterwork remaining above the false ceiling of the King's Theatre, Dundee - Courtesy Roger Fox and Mike Hall.